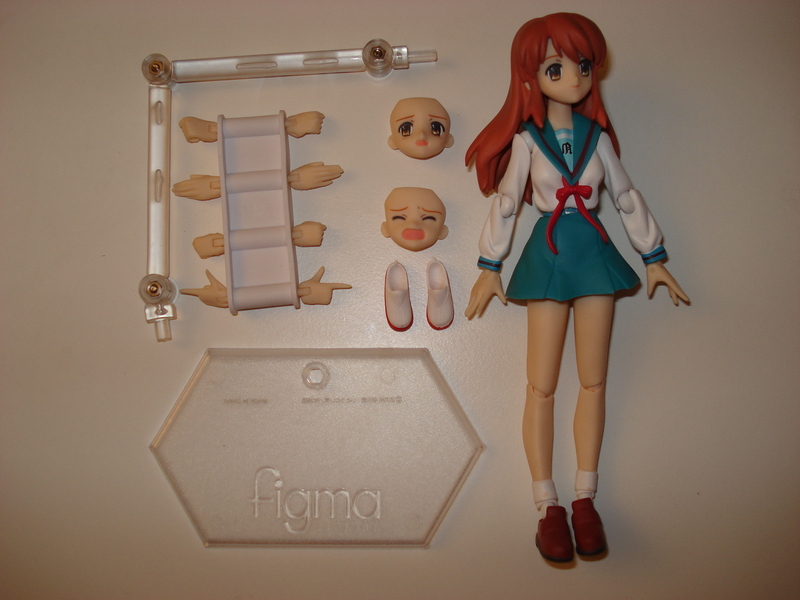 Published on October 22, 2008 in figma and Reviews. 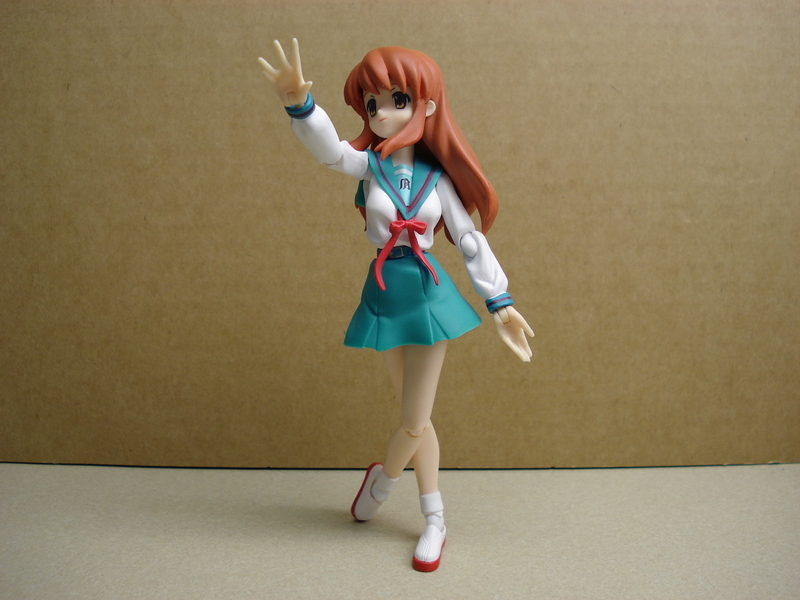 4 Comments Tags: figma, figma:mikuru, suzumiya haruhi no yuuutsu. 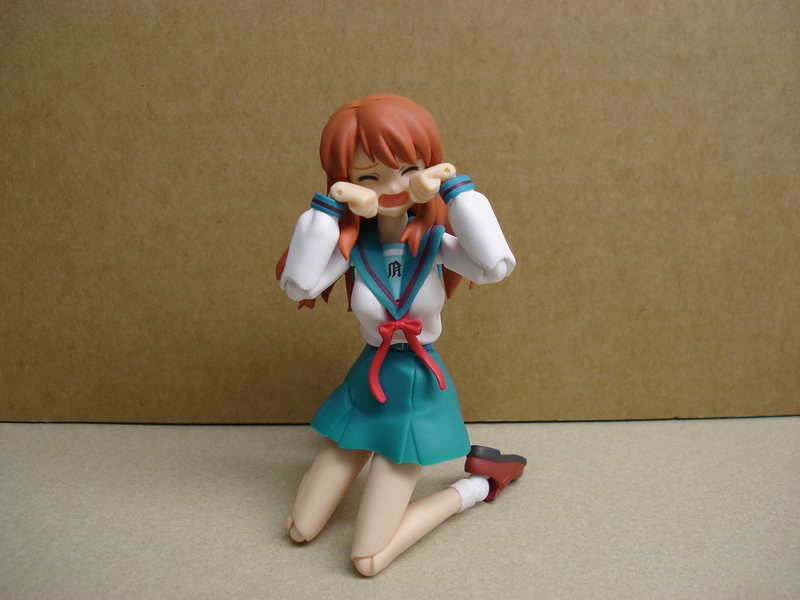 Today I review the Asahina Mikuru figma. 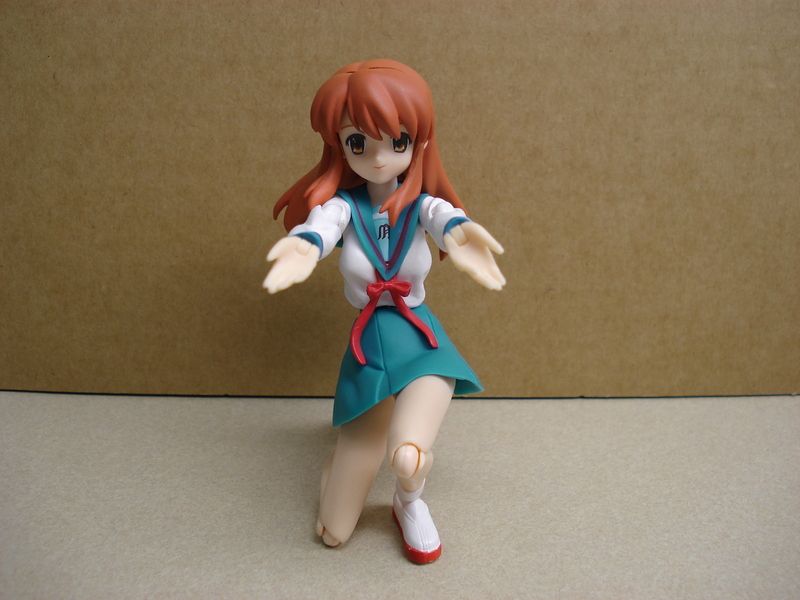 Take Mikuru’s hand to begin the journey. First of, as usual we’ll list the accessories. As is standard for the figma line, we have the 3 jointed stand and base as well as a full set of extra hands. 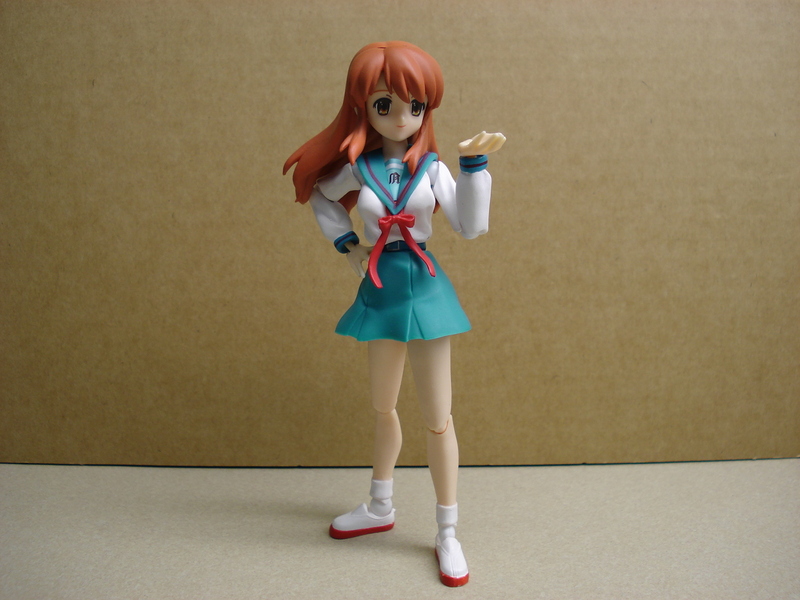 As is standard with the Haruhi figma series, we have a pair of indoor shoes for a second year student. 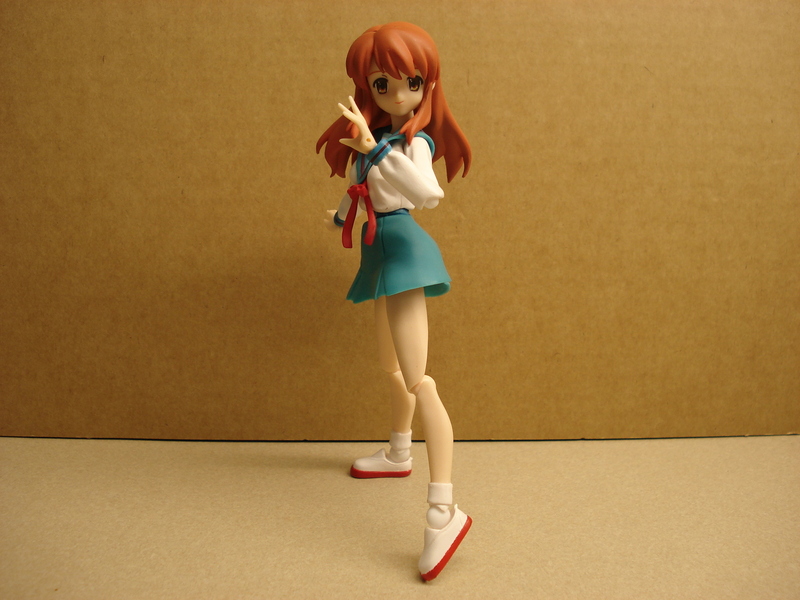 You’ll notice that Mikuru is the only figma that comes with the red bottom indoor shoes. That is because she is a second year student, regardless of how Haruhi treats her. 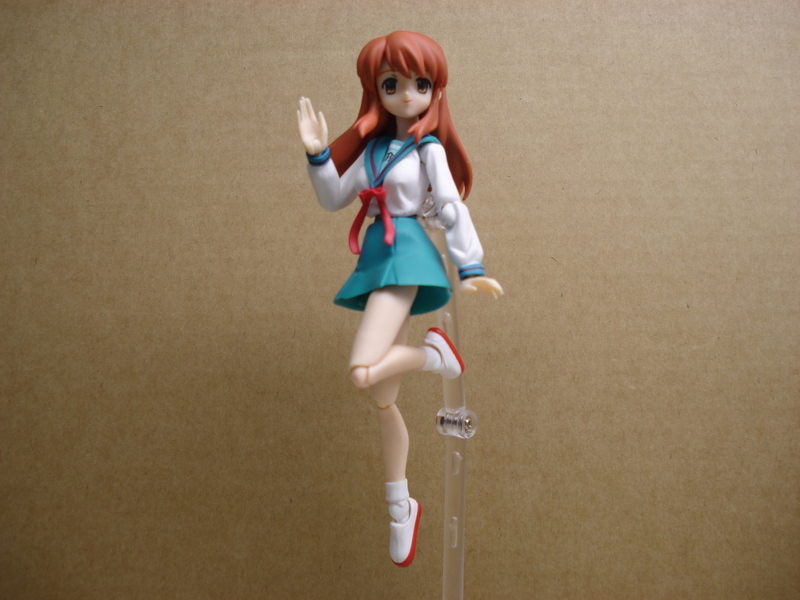 I’ve determined that the Haruhi series of figmas comes with the following: stand, base, extra hands, indoor shoes, extra face and one extra accessory. For Haruhi it’s the director’s cone and armband (that I consider to be one accessory, since you’ll want to use the Ultra Director armband with the cone, and not the Brigade Chief.) For Nagato, it’s the chair and books (OK, I’ll give you this, Nagato does come with more stuff than the rest, also coming with the megane set of bangs.) 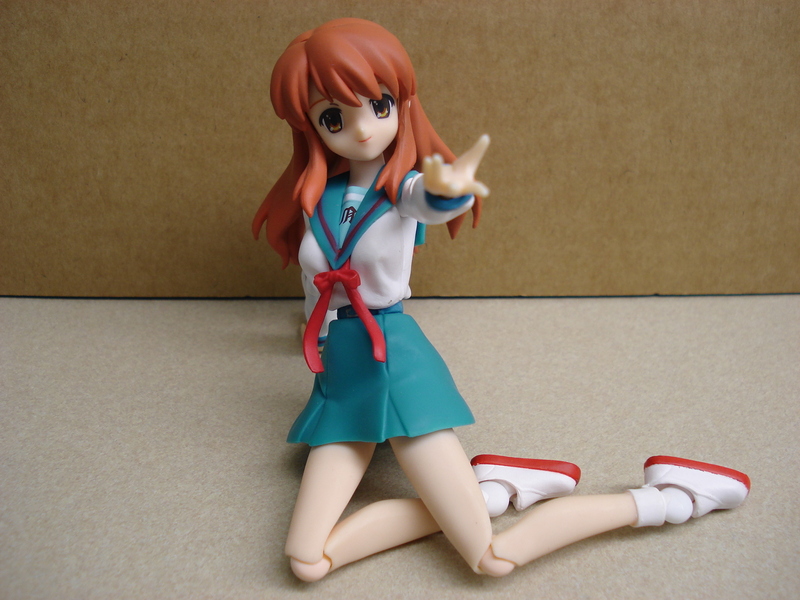 Kyon comes with the camera hand, and Koizumi comes with the SOS-dan room background from the ending theme. 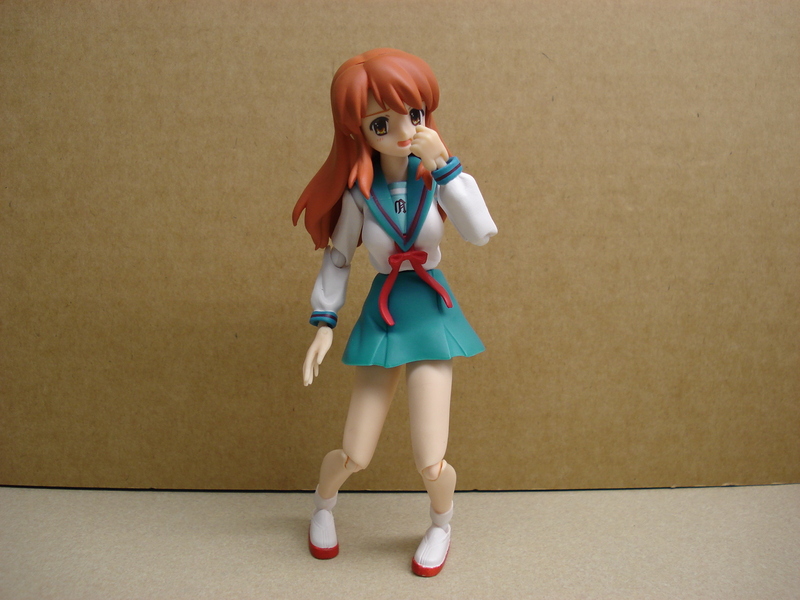 Mikuru’s extra accessory is… an extra face. 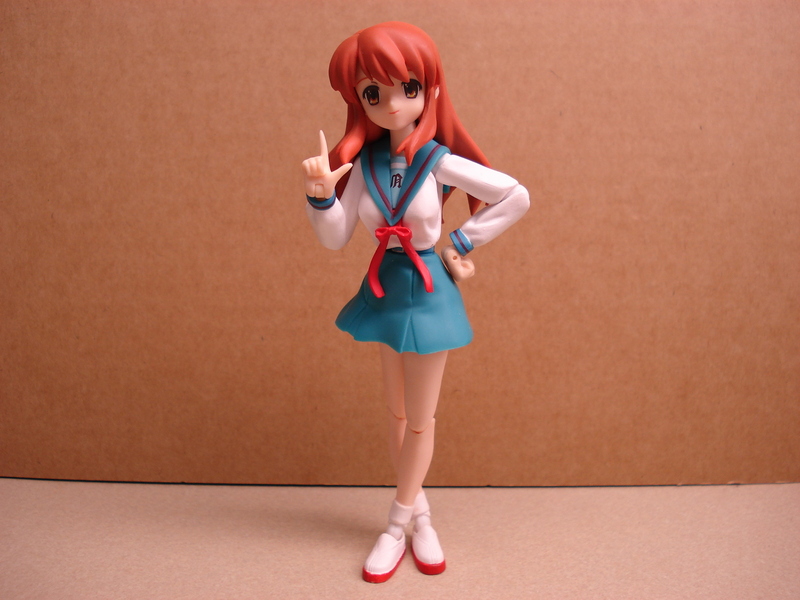 You’ve probably seen the countless Mikuru no Tease figma images on Danny Choo’s site. The reason is for these faces. One of the faces is a cautious face, and the other is an absolutely terrified face. 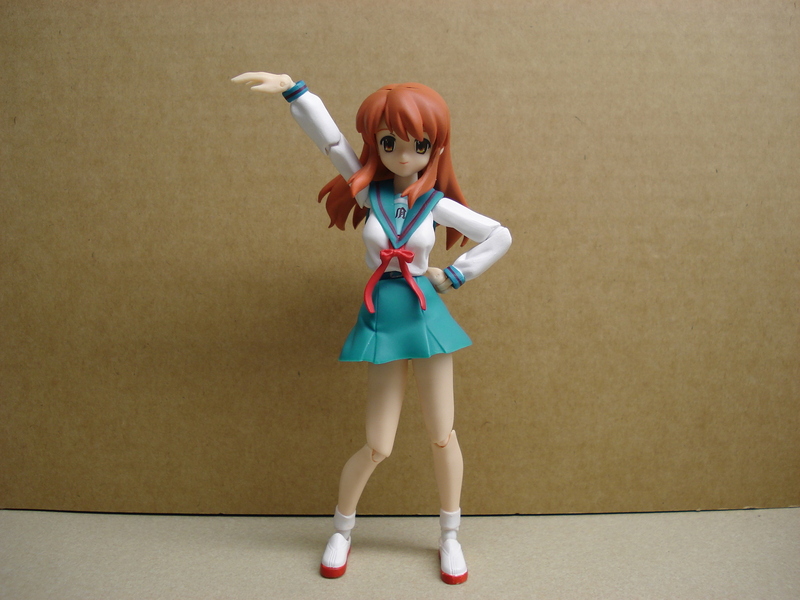 One piece of advice I have for Max Factory and Good Smile Company is to consider optional arms for the Haruhi line for the summer uniforms for the girls. You’d only need to make one set, and id’t work for every girl except for the initial Nagato figma. It’ll work for Evil Witch version though. Cons: Accessories. I already went over this above, so I won’t mention them again. The shoes aren’t labeled. Mikuru’s hair covers up the stand hole in her back, making it difficult to use the stand with her. This has been rectified in the Konata and Tsuruya figmas though, as a stand hole is included in the hair for use in posing with the stand. Normally I wouldn’t recommend a figma with such few accessories, but Mikuru is a must if you like the series. As I stated, she is very fun to put into awkward poses and tease. Mikuru will set you back $25-30 at most online stores before shipping. Will we see a Bunny Mikuru in the future? Kinsoku jikou desu! I was thinking the exact same thing about the arms and the summer uniforms. It wouldn’t be difficult to add them as accesories to upcoming haruhi figmas, like the cheerleader haruhi and mikuru that will be released in March. Summer uniforms WOULD be a problem for Kyon and Itsuki, which is probably why max factory is hesitant. Oh Koizumi COMES with the background set? That’s pretty awesome. If that’s true, am getting him.